I recently purchased a HP N40L Microserver for my home vSphere lab, with the intention of buying a second unit to create a small vSphere cluster for lab work. This would take me away from having nested virtual ESXi hosts. You can actually currently get great deals on this hardware – with HP offering £100 cashback on the purchase cost. 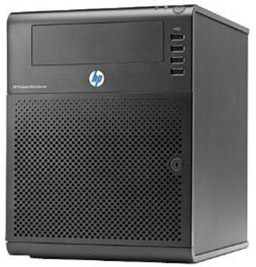 I ended up paying around £260.00 for my HP Microserver, getting 100 off, which means it only cost about £160. For this price, this microserver makes great hardware for a home lab cluster build, however the one thing that has always been a downer on this is the fact that all specsheets and official documentation from HP list the maximum amount of RAM supported as 8GB for the Microserver. This doesn’t leave much room for VMs to run per host. Today I received an interesting e-mail in my inbox from Serversplus.com. They claim to have tested running 16GB of Crucial ECC DDR3 Unbuffered (2 x 8GB modules) in the HP N40L Microserver! This, if it is true (which I am sure it is, as they are now selling bundles with 16GB RAM), is great news for us looking to build home labs on the cheap. Sure, 8GB modules are much more expensive than 4GB at the moment, but we now know that there is no 8GB limit on the N40L Microserver – rather 16GB. As soon as I can afford the two 8GB modules for a total of 16GB, I’ll be looking at upgrading my current Microserver to 16GB. If this works, I’ll definitely be purchasing a second unit. If you are UK based, you can grab the full bundle from Serversplus.com. I run 2 N36Ls in my home lab, only 8 GB for now. Thanks for this – interesting! Seems like its actually old news. Glad there are lots of reports of various modules able to run in these microservers. I had a look at the OCers link and that is actually a really useful thread. Thanks again! This is very good news, indeed. I just wish I had known this when I spec’d out my N40L. As it stands now, I’m sort of waiting around to see if a refresh is forthcoming. I’d really love to see a microserver with the same memory capacity (16GB, but acknowledged officially), SATA3, and I’d suffer a bigger case if they could squeeze 6 or 8 disks inside. I think if the disks were stacked in two columns, with the disks oriented horizontally, this could still be done in a relatively small footprint. The four disk limit is a bit constraining. I’d be willing to spend slightly more $$ for a machine so spec’d (but please, HP, don’t include any hard disk in the base model). @ki4otk … I know right. I wish I had known when speccing too. Perhaps I can ship the 2x4gb sticks back to Newegg. Agreed! I have no use for the included 250GB drive as it is. BIOS recognize 16GB – Windows Server 2008 R2 doesn’t (Installed 16GB – Available 8GB). Any ideas?!?! 978 days, 4 hrs and 7 min.